Brioche is a highly enriched French bread, whose high egg and butter content give it what is seen as a rich and tender crumb. It has a dark, golden, and flaky crust from an egg wash applied before and after proofing. The word brioche first appeared in print in 1404, and this bread is believed to have sprung from a traditional Norman recipe. It is argued that brioche is probably of a Roman origin, since a very similar sort of sweet holiday bread is made in Romania. The cooking method and tradition of using it during big holidays resembles the culture surrounding the brioche so much that it is difficult to doubt same origin of both foods. Brioche à tête is perhaps the most classically recognized form. Brioche à tête rolls are panned in fluted tins with a small spherical piece of dough placed on top. 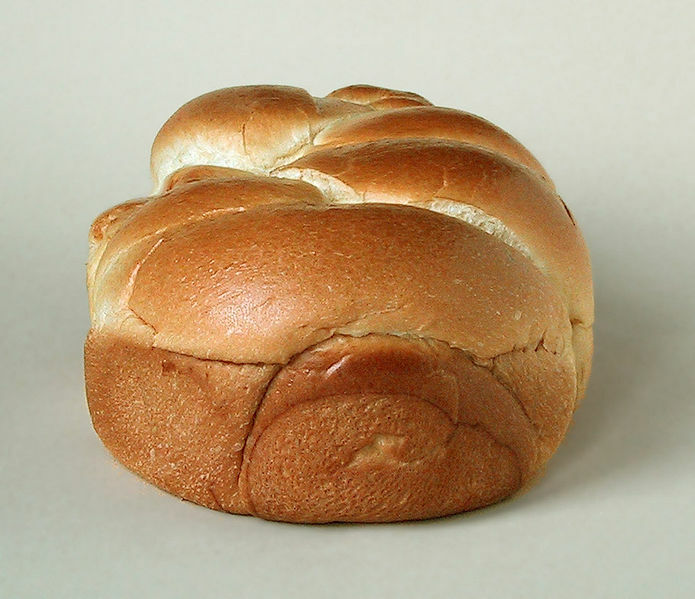 Brioche Nanterre is a loaf of brioche panned in a standard loaf pan. Instead of shaping one piece of dough and baking it, two rows of small pieces of dough are placed in the pan. Loaves are then proofed in the pan, fusing the pieces together. During the baking process the balls of dough rise further and form an attractive pattern.